Today I’m visiting the oldest still-operational lighthouse in Florida, the Amelia Island Lighthouse. It’s other claim to fame is that it is the western-most lighthouse on the east coast. Located on a 60-foot bluff overlooking Egans Creek, the inland location of this light has allowed it to survive in great condition. Other lights that were erected around the same time as this one but closer to the shore have since been washed out to sea. First of all, this lighthouse is hidden away on a residential street. We drove right past the long driveway that leads to a locked gate. Locked gate, you say? Yes, secondly, the visiting hours are very restrictive. Only open for a few hours each Saturday (11am-2pm) or for during the week tours, you need to plan ahead to see it legally. Or, just show up and jump the fence for a few photos. Elsewhere on the web, I found a site that explains what happens during the tour. Apparently they open the doors, but won’t let you climb to the top. 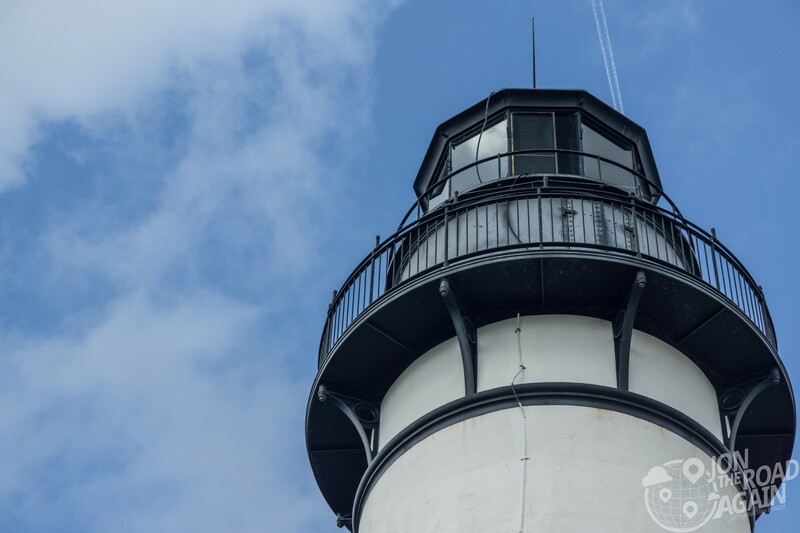 Visitors can walk the lighthouse grounds, get some great photos of this historic landmark, and step inside the bottom of the lighthouse. 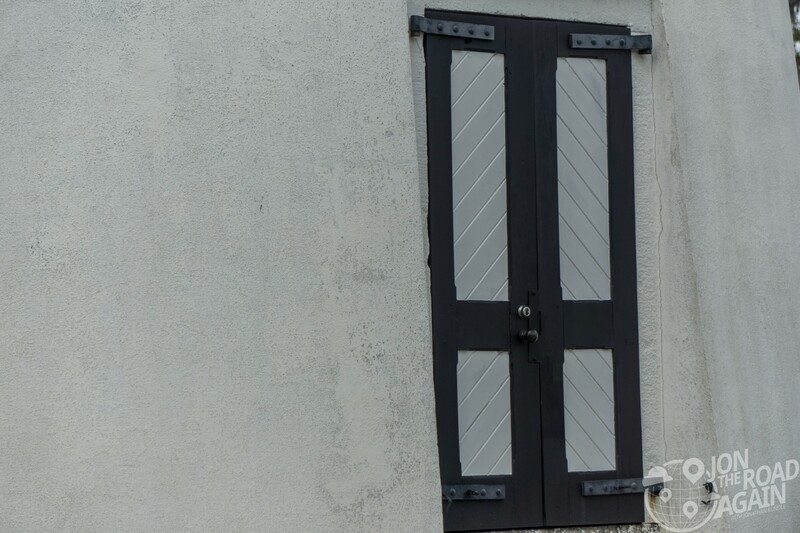 Most people want to climb to the top when they visit a lighthouse—no-can-do here. Climbing the lighthouse staircase to the top is not permitted at any time. Boo! 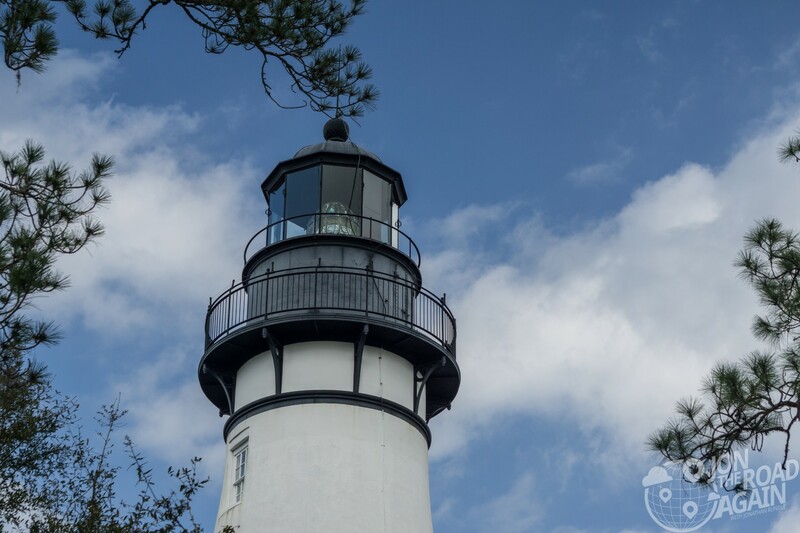 When built, the Amelia Island lighthouse used oil lamps. The lamps were fueled with whale oil and then they used kerosene. The original oil house has survived—it is the little white building at the foot of the tower. 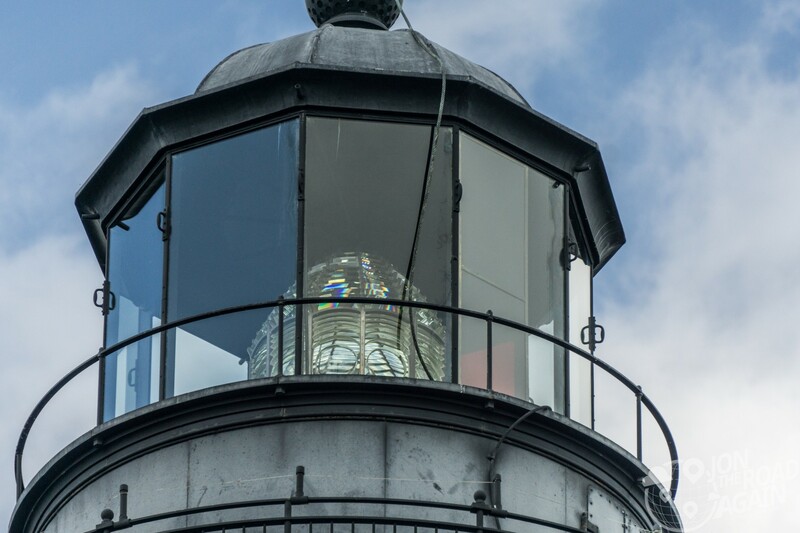 In 1903, the oil lamps were replaced with the third-order Fresnel lens that is still in place today. In 1933, the Amelia Island lighthouse was electrified, and then in 1970, the light was automated, ending the era of lighthouse keepers. Twenty-one lighthouse keepers had managed the upkeep of the Amelia Island lighthouse from 1838 to 1954. These dedicated men had to carry buckets of oil to the top every few hours to keep the light shining. As I mentioned earlier, it’s difficult to get up close to this lighthouse if you’re crunched for time, did not plan ahead (or don’t want to jump a fence). 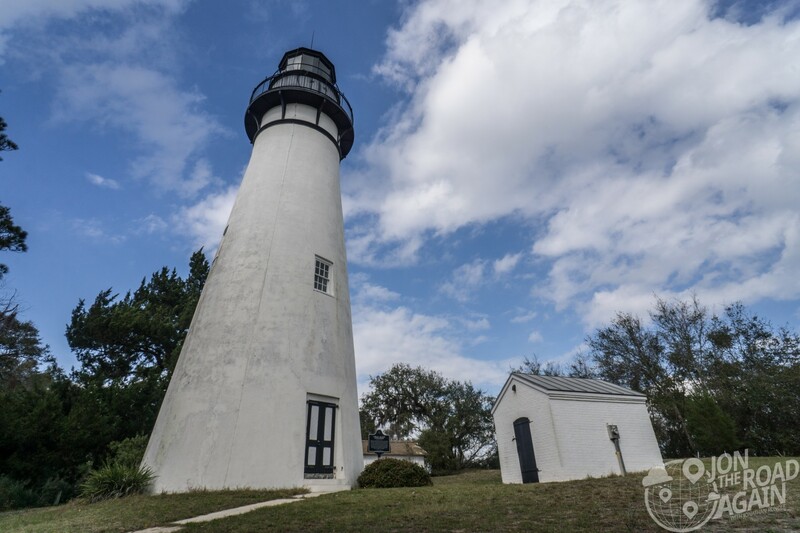 Lighthouse tours can be arranged through the Fernandina Beach Recreation Center by calling (904) 310-3350 (reservations are required in advance). Lighthouse tours are only given two days per month (the first and third Wednesday monthly at 10 am). The gates to the lighthouse property are also opened up for a few hours on Saturdays from 11 am to 2 pm, allowing visitors to walk around the lighthouse grounds and take photos—no access to the tower. This isn’t the only lighthouse around these parts—a little later on we’ll visit the St. Augustine Lighthouse. Very pretty,but I’d want to go to the top.